Look at Things from a Different Outlook: Try to place yourself in the shoes of the individual with the brain injury, and view situations through his or her eyes and abilities. Create Structure: A structured day is typically essential to recovery because it can help the individual retrain the brain and realize what to expect during the day. Patience Is Crucial: Empower the person to undertake tasks at his or her own pace to help rebuild independence. Utilize patience in listening, enabling the person to finish talking without interrupting, even if it takes time to find the words. This helps the person relearn communicating abilities. It’s Ok to Help, But Refrain from Doing: If the individual seems to get “stuck” in an activity or is repeating actions, he or she may merely have the need for a little help processing information. Refrain from taking over the task, but instead suggest straightforward tips. 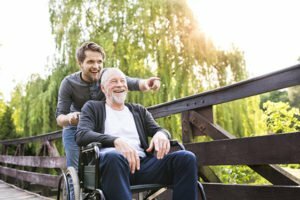 At times, people with brain injuries will need to accomplish a task in a very particular order as they retrain their brains. Allow Many Chances for Rest: A person with a brain injury needs more rest than usual. It is not due to being lazy. It is draining for the person to process and organize thoughts, specifically when tired. Stay Alert During Social Situations: Crowds or parties can be daunting with too many conversations and loud noises transpiring. Keep in mind that it may well be too much to process and the person might benefit from a break. Never Treat the Individual like a Child: Be sure you never talk down to the person. Even though you may be trying to be of assistance, it can appear belittling. Dealing with Challenging Behaviors: It’s essential to establish what triggered a behavior. Was the person fatigued? Did too much noise lead to anxiety? Was a specific routine changed? If possible, prevent those triggers to help avoid the difficult behaviors. Remain Sensitive to Powerful Emotions: Understand that the individual may become more frustrated or agitated, or might be more sensitive than pre-injury. Keep in mind that many things which used to be second nature now warrant a great deal of energy to accomplish. Offer Hope and Encouragement: Celebrate every single achievement. Every moment of advancement, however small, is a victory. New discoveries and stories of healing are taking place every day. No one person’s recovery is just like another. Find Support: You should never be your loved one’s sole support system. The person will gain from a range of professionals and online or local support groups. And, as a family caregiver, it’s important that you recognize how stressful life can be and to find support services for yourself as well. Hired Hands Homecare can provide specialized care for those who’ve experienced a traumatic brain injury. Contact us at (866) 940-4343 for a trusted partner in the elderly care Santa Rosa families need.